How does your business create, deliver and capture value? The idea is to get all the key elements of your business on a single page. It can be used to review an existing business model or define a new one. Key partners: who are your key partners/suppliers? Key activities: what key activities does your value proposition require? Which are the most important for distribution channels, customer relationships, revenue stream etc? Value proposition: what core value do you deliver to the customer? Customer relationships: what relationship that the target customer expects you to establish? How can you integrate that into your business in terms of cost and format? Customer segments: who are our most important customers? Key resources: what key resources does your value proposition require? Distribution channels: which channels work best? How much do they cost? How can they be integrated into your and your customers’ routines? Revenue stream: how does the business earn revenue from the value propositions? What are some of the advantages of using a business model canvas? BMCs are visual and intuitive, which makes it easier to communicate ideas. It forces you to think of your business in a more scientific and formal way. It reduces your business model into a set of assumptions that you can test to either validate or reject. The overall layout forces you to think about key aspects of the business. It is easy to create and maintain, which makes the business models very agile, adaptable, and in-sync with the realities of the business. Grab the template link above and share it with your team. Everyone can add sticky notes, files, files and ideas to fill out each section. Work together in real-time, no matter your location! 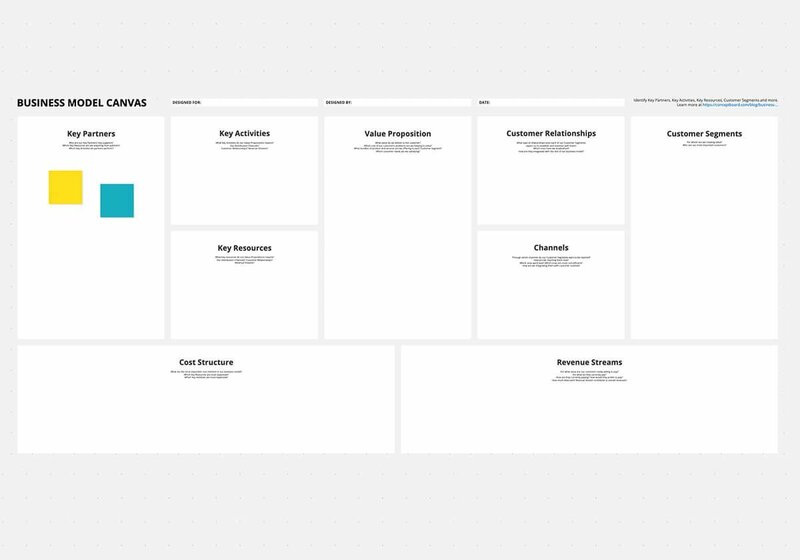 Then check out the Conceptboard Template Gallery, where you can find other service design templates like our Customer Empathy Map and Value Proposition Canvas.